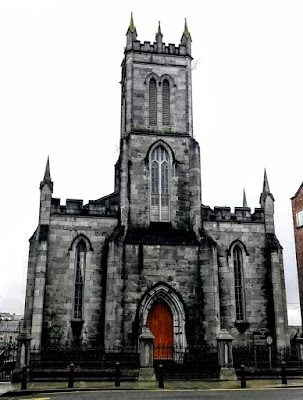 At one time, there was a large number of Church of Ireland parish churches in Limerick’s city centre. They included Saint George’s, Saint John’s, Saint Munchin’s, Saint Nicholas Church, and Trinity Episcopal Church. Although many of these buildings survive, today, apart from Saint Mary’s Cathedral, Saint Michael’s is the only working Anglican church in Limerick City. Saint Michael’s Church, which is part of the cathedral group of parishes, is in the heart of Georgian Limerick. The church stands at the top of Barrington Street, at the south end of Pery Square, facing Saint Saviour’s Dominican Church at the opposite, north end. The original Neo-Georgian façades of Pery Square give balance to the urban composition of two similarly scaled and styled churches that enclose the vista of the street to the north and the south. The Anglo-Normans probably built the first church in Limerick dedicated to Saint Michael the Archangel (feast day, 29 September). This church stood on an island where the Abbey River spreads out above Baal’s Bridge. From old maps and drawings, this island was between Englishtown and Irishtown. This area was outside the city gate called West Watergate. Saint Michael’s is first referred to in the Black Book of Limerick in 1205. It was originally a prebendal church, but by 1418 it was attached to the Archdeaconry of Limerick. The church fell into disuse after the Reformation. By the early 17th century, it was in ruins, and it was totally dismantled at the time of Cromwell’s siege of 1651. The present Saint Michael’s Church in Pery Square replaced an older church, Saint George’s Church on George’s Street, now O’Connell Street, which was built in 1789. Between 1831 and the completion of Saint Michael’s Church in Pery Square, there was no Church of Ireland church in the Parish of Saint Michael except Trinity Church in Catherine Place, and some of the parishioners met in the Primitive Methodist Preaching House until 1843. This meant that the rector of the parish had the spiritual care of the parishioners but was without a church. The walls of Saint Michael’s Church were built from the money received by the sales of Saint George’s Chapel. However, the Methodists gave notice in 1843 that they would withdraw the privilege granted to Saint Michael’s parishioners, and so an application was made to the Church Commissioners and a sum of money was granted to complete the church. Saint Michael’s was designed around 1836 by the Limerick-based architect James Pain and his brother, George Richard Pain, and was built by William Wallace. The church was consecrated when it was completed in 1844. It was also known as ‘the sinking church’ as it was not built on bed rock and has sunk ever so slightly over the years. It is located at the end of Barrington Street and Pery Square. The church was designed in a late Georgian Gothic Revival style, but was built in a simpler form than the original design and without the spire. The site is much deeper than the street level, and this allowed the provision of a crypt beneath the buildinf. The church has a north-facing limestone façade, comprising a three-stage tower with a crenallated parapet with corner and intermediate pinnacles. The tower is flanked by lancet windows and contains the main entrance. The gates to the left of the church once led down to a number of tennis courts and recreation areas for the parish and the schoolmaster’s Victorian Gothic residence. The windows of the church are pointed-arched openings with elaborate Gothic style tracery that mirrors the pointed-arched door openings. Inside the church, plain plastered walls emphasise the unusual hammer beam roof structure with arch braces encased by tongued and grooved panelling. Originally, the church had galleries on three sides and could hold 2,000 people. The interiors also include polished marble columns, limestone arches, stained glass windows and an encaustic tile floor in the nave aisle flanked by early box pews. The richly carved mahogany pulpit with Gothicised panelling was donated by Thomas Revington and made by Todds. Joseph Fogerty & Son carried out improvements to the church in 1877, when the tower was raised and additional pinnacles were added, helping it to break forward from the façade. As well as an extra stage to the tower, other additions at the time included a new forecourt and a new chancel. The new chancel was added at a cost of £2,000 by William and Robert Fogerty and the two side balconies were removed, reducing the seating capacity of the church to 800. The East Window, which was designed by James Pain for Saint Mary’s Cathedral, was reduced in size to fill the space in new chancel area. The church re-opened on 18 November 1877, and new stained glass, illustrating the Parables, was erected the following year . Further work was carried out by Charles W Harrison of Dublin in 1883 with the design of the mural monument in memory of Mrs Purdon Wilkinson. A hall was built behind the church in 1980, further reducing the seating capacity to 600 and a new roof was erected in 1997. Saint Michael’s was completely restored in 2013, and continues to provide a vibrant Anglican presence in the heart of Limerick.